Google Image Search has a new option that allows you to restrict the results to photos: just select "Return images that contain photo content" from the advanced search page. A simple way to find photos would be to restrict the results to JPEG files, but a search for Gmail shows that many people use the JPEG format for logos and screenshots. If we use Google's image analysis technology, we'll find more photos related to Gmail, including the Gmail soap, Gmail Theater and Gmail's product manager Keith Coleman. The other two content restrictions available in Google Image Search are for images that contain faces and for images that illustrate recent news articles. Microsoft's image search engine has more advanced options for refining your search: you can find photos, illustrations, faces and portraits. But does the Microsoft Live search filters work as well as the Google ones, if not then it's not really any use. A few years ago (in school) I need to add a photo of some balls to a piece of work. MSN search (as it was then) found me images of men with no clothes on. Not what I was searching for. Google produced pictures of basket balls, footballs, etc. Much better, but both strictly true in some ways. 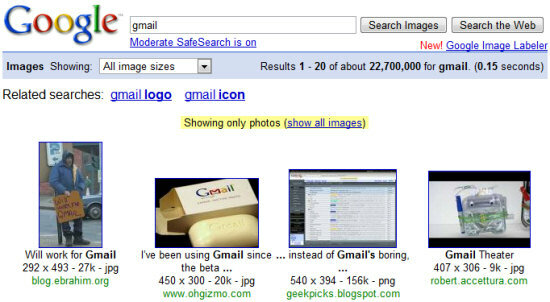 Obviously you had the SafeSearch filter turned on in Google, and not in MSN. Actually, MSN Search = Live Search, something which should be obvious to anyone who looks at the logo or at the page's title. SafeSearch is not perfect and there are always images difficult to categorize, but Google usually does a better job at finding relevant images and filtering adult images. Live Search Images has a cool interface and a lot of interesting features (scratchpad, aspect ratio filter, related people, interactive zoom) but the results aren't very good. I have one famous author photo in my system, how do search the person with his photo in google. Is there any site. I have only photo, i dont know anything about him. 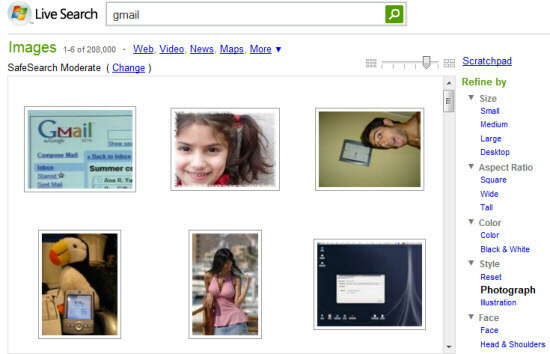 How about a Google photo search that lets a user input a part of a image as the search phrase? How cool would that be?? It's possible, you know. i want to save my photo in google web so please save my picture in google. I always open the google photo to search on any photo i would like to see in the internet. It's easy and is fun. Everyone has to try it.